April 17, 2019! 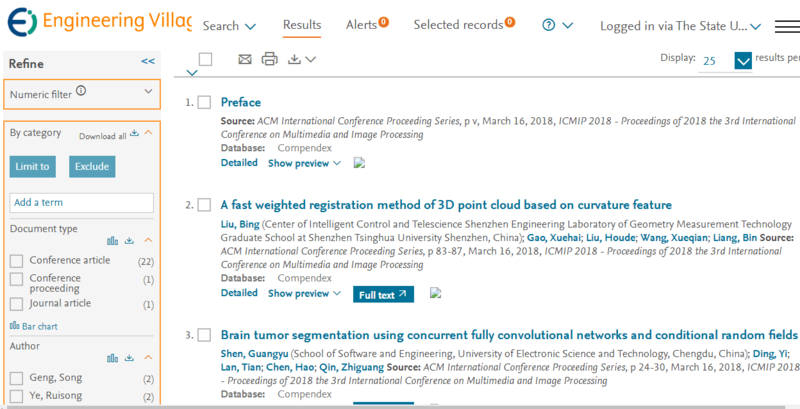 ICMIP 2019 conference proceedings have been online in ACM Digital Library. April 12, 2019! ICMIP 2020 will take place in Sri Lanka during January 10-12, 2020. January 22, 2019! ICMIP 2019 conference was held successfully in Jan. 19-21, 2019 in University of Malaya, Malaysia. Thank you for your active input and participation! November 28, 2018! Welcome Prof. Liyanage C De Silva to make the speech "Internet of Things (IoT) Leading to Internet of Trees (IoT)". October 10, 2018! The last submission round starts with deadline to November 20, 2018. September 6, 2018! The submission deadline extends to October 10, 2018. Welcome to submit your abstract/full paper. August 14, 2018! Welcome Prof. Datin Dr. Sameem Binti Abdul Kareem from University of Malaya, Malaysia to deliver the plenary speech in ICMIP 2019. June 22, 2018! ICMIP2018 conference proceeding has been indexed by Scopus already. June 20, 2018! ICMIP2018 conference proceeding has been indexed by Ei Compendex already. June 4, 2018! Welcome Dr. Chau Kien Tsong from Universiti Sains Malaysia, Malaysia to deliver invited speech in ICMIP2019. May 14, 2018! Thanks Prof. Ce Zhu, Prof. Yulin Wang and Prof. Chin-Chen Chang's continuted support to ICMIP2019. Welcome them to deliver keynote speeches in Kuala Lumpur. May 10, 2018! ICMIP2017 conference proceeding has been indexed by Ei compendex and Scopus. May 10, 2018! ICMIP2018 conference proceeding has been available in ACM Digital Library. Jan. 16, 2018 Good News! ICMIP 2018 will be held in Novotel Guiyang. Jan. 1, 2018 Good News! Welcome Prof. Asmaa Shaker Ashoor Alzubaydi and Prof. Tushar H. Jaware to join in our technical committees. Dec. 26, 2017 Good News! ICMIP 2017 conference proceedings has been included in IEEE Xplore already. Dec. 16, 2017 Good News! The paper submission has been extended to Jan. 20, 2018. Welcome you to submit your paper. Nov. 22, 2017 Good News! Welcome Dr. Ivan Viktorovych Izonin and Prof. Priteshkumar Prajapati to join in our technical committees. Nov. 20, 2017 Good News! Welcome Prof. Khalid ABBAD, Dr. Gururaj R. Mukarambi, Konstantin Kozlov, Prof. Yi Ding, Prof. Tian Lan, Prof. Kui Xu to join in our technical committees. Nov. 11, 2017 Good News! The second round of paper submission has begun. Welcome you to submit the paper before Dec. 15, 2017! Oct. 18, 2017 Good News! Welcome Prof. Hao Xiangyang to serve as the program co-chair. Oct. 16, 2017 Good News! Welcome Prof. Ghazali Bin Sulong, Universiti Teknologi Malaysia, Malaysia to serve as the program co-chair. Sep. 30, 2017 Good News! Welcome Prof. Aleksandr Cariow, West Pomeranian University of Technology, Szczecin, Poland to serve as the program co-chair. July 24, 2017 Good News! Welcome Prof. Liyanage C De Silva, University of Brunei Darussalam, Brunei Darussalam to make the keynote speech! July 1, 2017 Good News! Welcome Prof. Ce Zhu, IEEE and IET Fellow, University of Electronic Science and Technology of China, China to make the keynote speech! June 22, 2017 Good News! Welcome Prof. Chin-Chen Chang, IEEE and IET Fellow, Feng Chia University, Taiwan and Prof. Yulin Wang, Wuhan University, China to make the keynote speech! May 30, 2017 Good News! ICMIP 2018 will be held in Guiyang, China on Mar 16-18, 2018.